Side Mirror - Your live demo secret weapon. Side Mirror is a Mac app that shows what's on the projector in a window on your main display. No more looking behind you! Side Mirror shows you what's behind you so you don't need to turn around. Keep your eyes toward your audience. Preview window is hardware accelerated, 60-frames per second. 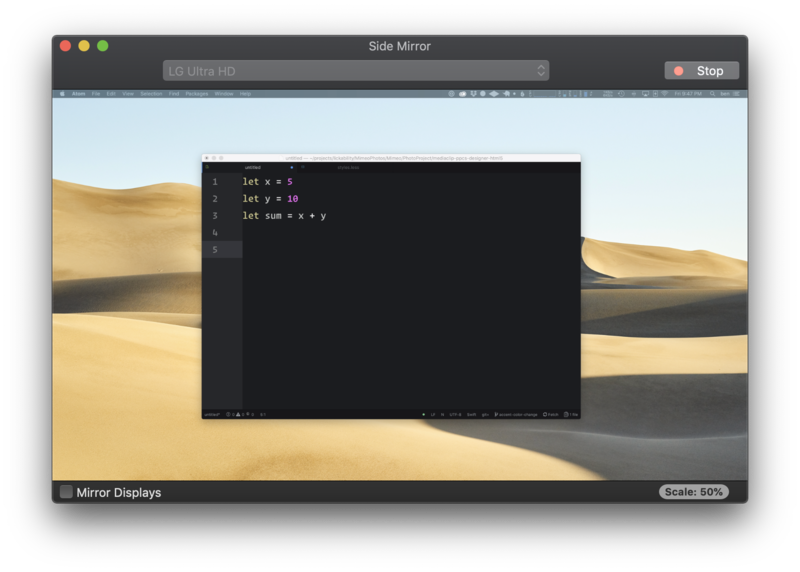 Side Mirror supports macOS Mojave, including Dark Mode. Includes 1-click access to toggle mirroring of your displays. Get Side Mirror on the Mac App Store. Side Mirror was built by Fickle Bits. All Rights Reserved.